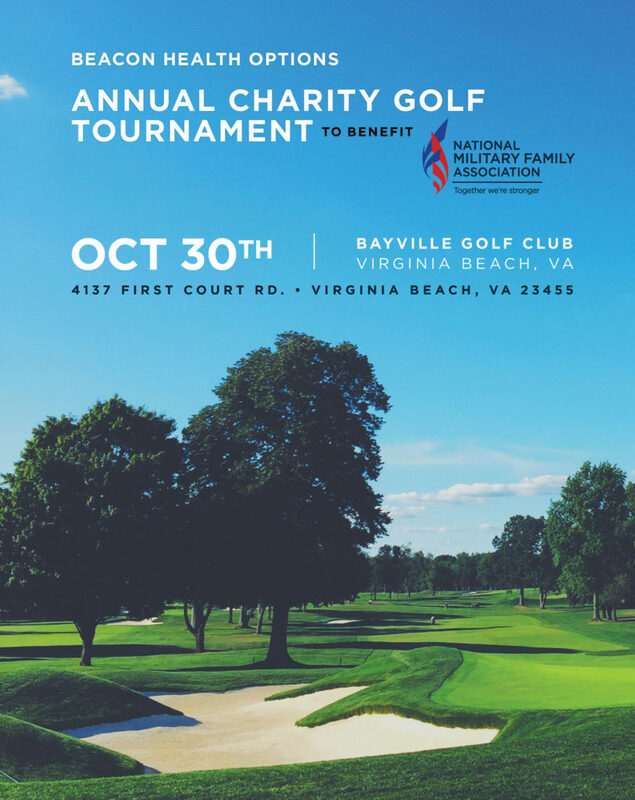 NORFOLK, Va., Oct. 11, 2018 – Beacon Health Options, a leader in behavioral health management, is pleased to announce it will host its sixth annual Charity Golf Outing on Tuesday, Oct. 30, at the Bayville Golf Club in Virginia Beach. Proceeds from the outing will go to the National Military Family Association (NMFA), which provides support and guidance for military members and their families. Locally, Hampton Roads, Va. is home to one of the largest concentrations of Department of Defense personnel in the United States. With more than 100,000 military family members residing here, NMFA’s vital programs help these military families every day. NMFA works to improve awareness of the value of mental health services and in ensuring military families know they can seek help without fear. Net proceeds from this year’s outing will help the nonprofit organization with its Operation Purple® Program, including camps that help children deal with a parent’s deployment; Family Retreats that aim to strengthen families after deployment; and its Healing Adventures Program for families of service members who are wounded, ill or injured. The funds will also help provide scholarships to military spouses, as well as support many other programs. At press time, this year’s lead sponsors include: CDW at the Hope Level; HighPoint Solutions at the Courage Level; Accenture and WebbMason at the Support Level; Converge One/Nice, WorkPlace Options, Verizon, ASI Systems and Satsyil at the Recovery Level. The National Military Family Association (NMFA) is the leading nonprofit dedicated to serving the families who stand behind the uniform. Since 1969, NMFA has worked to strengthen and protect millions of families through its advocacy and programs. They provide spouse scholarships, camps for military kids, and retreats for families reconnecting after deployment and for the families of the wounded, ill, or injured. NMFA serves the families of the currently serving, veteran, retired, wounded or fallen members of the Army, Navy, Marine Corps, Air Force, Coast Guard, and Commissioned Corps of the USPHS and NOAA. To get involved or to learn more, visit www.MilitaryFamily.org.